This puzzled the farmer… but he liked the young man. So he hired him. A few weeks later, the farmer and his wife were awakened in the night by a violent storm ripping through the valley. He leapt out of bed and called for his new hired hand, but the young man was sleeping soundly. So they quickly began to check things to see if all was secure. They found that the shutters of the farmhouse had been securely fastened. A good supply of logs had been set next to the fireplace. The farmer and his wife then inspected their property. They found that the farm tools had been placed in the storage shed, safe from the elements. He sees that the bales of wheat had been bound and wrapped in tarpaulins. The tractor had been moved into its garage. The barn was properly locked tight. Even the animals were calm and had plenty of feed. All was well. 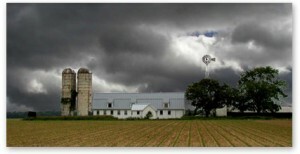 Because the farmhand did his work loyally and faithfully when the skies were clear, he was prepared for any storm. So when the storm did actually break, he was not concerned or afraid. He could sleep in peace. If we tend to the things that are important in life, if we are right with those we love and behave in line with our faith, our lives will not be cursed with the aching throb of unfulfilled business. Our words will always be sincere, our embraces will be tight. We can sleep in a storm. And when it’s our time to go, our good-byes will be complete.